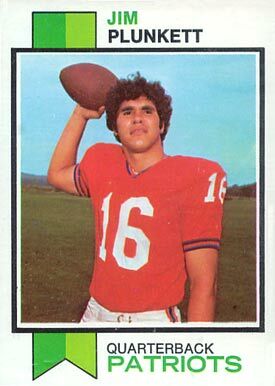 1973 Topps football card of former NFL quarterback Jim Plunkett, a 16 year veteran of the league. Although he was a prize top draft pick of New England, he struggled there and later with the San Francisco 49ers before catching on with the Oakland Raiders. Plunkett then came into his own, guiding the Raiders to a pair of Super Bowl wins. Born in New Mexico, he was the first Latino quarterback to win the big game. Always considered underrated or perhaps because of the failures of his early career, Plunkett is the only two-time Super Bowl winning QB not to be enshrined in the Pro Football Hall of Fame.